Back in May, Michael Che and Colin Jost opened the final "Weekend Update" of the season by citing the one-year anniversary of the special counsel's investigation into President Donald Trump's campaign. Or, as Jost put it: "The first anniversary Trump actually remembered." 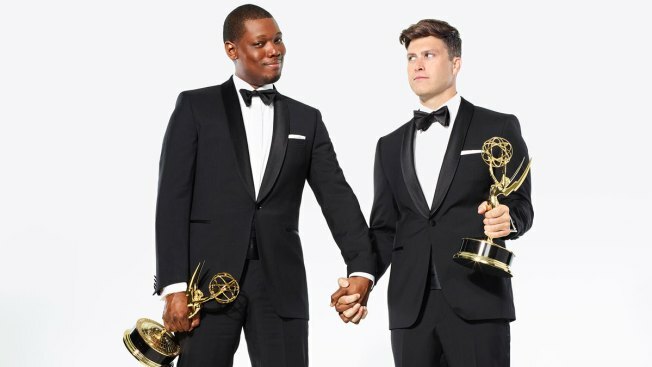 On Sept. 17, Che and Jost return to television in a bid to forge a memorable turn of their own as first-time hosts of the Emmys. The "Saturday Night Live" duo will play their most prominent stage yet on the biggest night of the year for TV – and late-night TV comedy. "SNL" is up for 21 awards, the most of any comedy program (nominees include the show's writers, Che and Jost among them). Meanwhile, the weeknight late-night competition is fierce. Jimmy Kimmel and James Corden stand among a field of nominees packed with top talent spawned from "The Daily Show": Samantha Bee, Stephen Colbert, 2016-2017 winner John Oliver and the show's current host, Trevor Noah. Che and Jost might not carry the comedic cool of the crowd from "The Daily Show," which overhauled the "Weekend Update" approach under Jon Stewart. But the pair has developed strong chemistry, combining Jost's sly snark with Che's no-nonsense calling out of B.S. Still, the Emmys are unfamiliar turf for them. And the last time the awards went with more than one host – the 2008 edition featured five reality TV figures – critics and viewers revolted. The hosts-to-be might want to study former "Weekend Update" duo Tiny Fey and Amy Poehler, whose tag-team act elevated the Golden Globes from 2013 to 2015. Che and Jost also should look at the approaches of two other "Weekend Update" alumni who used the Emmys to raise their profiles. Seth Meyers' quip-filled 2014 hosting gig provided a boost during his early "Late Night" run. Jimmy Fallon's 2010 rollicking Springsteen-meets-"Glee" opening number suggested "Late Night" was a way station on the track to "The Tonight Show." The current "Weekend Update" anchors need to find a way to distinguish themselves, beyond their usual patter (singing is probably a non-starter). Che grabbed headlines recently for defending the attempted comeback of Louis C.K., who admitted in November to sexual misconduct. That's far from optimal publicity for two guys hosting the first Emmys of the #MeToo era, whose first anniversary is approaching. Che and Jost arrive to the awards show just short of their fourth anniversary as a team. They have opportunity to make a strong impression on an NBC broadcast that's not "SNL" – and make Sept. 17, 2018, a night to remember.